That $2,500 in instrumentation would be a bit over 70 thousand in today’s dollars, and I’m happy to say that our department has far more instrumentation than that. The reference to thousands of specimens and stereopticon slides got me thinking about what was taught in Chemistry 118 years ago (hey that’s one year for every element on the periodic table). A quick web search brought me to this article, (which is behind a paywall if you don’t have access to ACS journals) that reviews an historical Chemistry textbook from 1809. 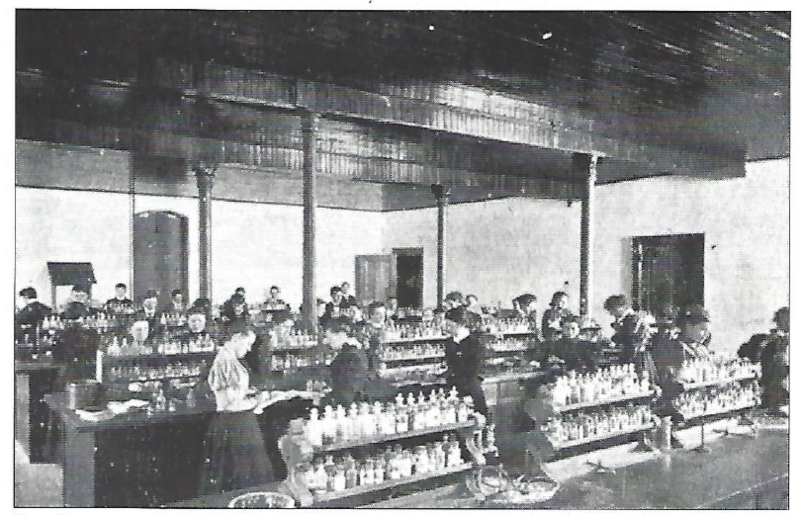 It was written by Jane Marcet to “… provide women with a method of educating themselves in chemistry …” and uses a conversational style that is not seen in contemporary instructional materials. This #ThrowbackThursday has me thinking about revisiting some teaching styles (to justify procrastinating on that pile of grading for one more day). From the Daily Eagle, courtesy of librarian Charlie Cowling, a snapshot of Chemistry instruction from the 1950s. Apparently, Chemistry wasn’t dangerous enough to necessitate safety goggles back then, (but it was too dangerous for girls…). How times have changed. Back in the 1950s the College was, as its own literature stated, a “single purpose” institution, and that purpose was teacher training. Later in the mid-1960s the College would as part of its ongoing expansion become a comprehensive liberal arts college, with various majors, such as chemistry for example. 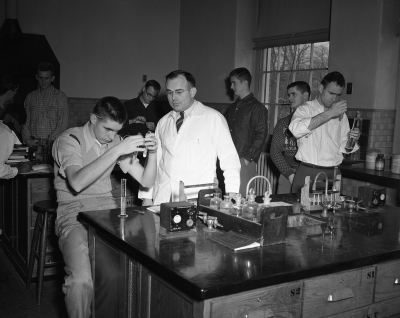 But before then we still were teaching chemistry here, to aspiring science teachers, and one of the faculty was Robert Brandauer, who taught here from 1946-1970. In a 1947 Stylus article he is described as “…the man with a million dollar smile…” He had an MS in Chemistry from Cornell (1939,) and at the time was working on his doctorate. In a curious coincidence he had previously taught at Roberts College in Istanbul, where Professor Martin Rogers had also taught. Faculty like Brandauer were in from the beginning of that incredible arc the school traveled, from a small teachers college with less than 1,000 students to a major comprehensive institution with almost 10,000 students. My wife has been tending to these orchids for a number of years. When we were in Chicago, they looked kind of sad. They seem to like the Brockport air (which has much less traffic pollution, so I don’t blame them). Click on the picture to get a bigger image. 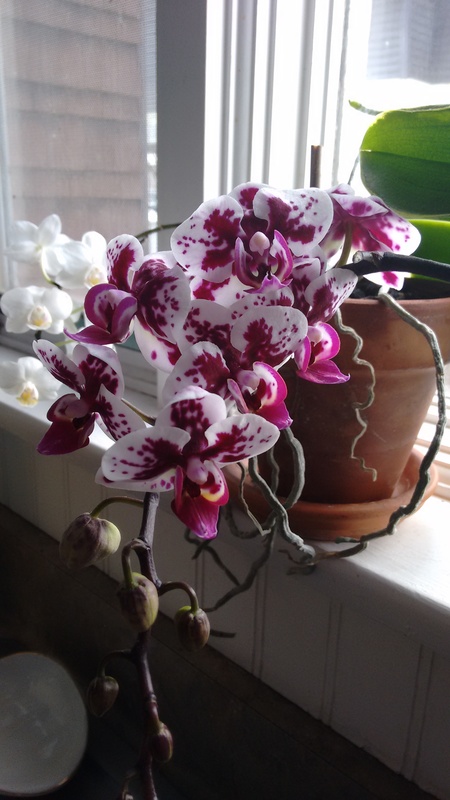 The purple orchid seems to be very pleased by finally having a non-south-facing window to sit in. Speaking of purple, today is Henry Perkin’s 180th birthday (thank you for honoring a Chemist, Google). Perkin is known for discovering a way to produce purple dye. His story, which is detailed in a very readable book by Simon Garfield, is worth picking up if you have a few hours to spare.